I haven’t used Google+ yet, so these thoughts are uninformed by any product use or testing. But they’re conceptual, anyway, so no matter. It’s a given that one of the byproducts of mediating social technology use is that the technology forces what is in everyday life implicit, explicit. Technologies bracket out situational cues and facework, so the gestures and expressions with which we communicate intent are either lost or stated explicitly. All of our social ratings and gestural systems (in social apps) are an illustration of this. No problem and no big deal. They’re not perfect, but we know they’re not. What’s interesting to me about Google+, and which I’d love to know from those of you have tried it out, is how it feels to assign people to different circles. Many have claimed that Facebook’s social graph is artificial — not really a reflection of how and with whom we interact in real life. Granted. But, so, too, is declaring circles of friends and colleagues. The reason must have to do with social boundaries. Social boundaries are epiphenomenal in real life. That is, they are soft and flexible, porous and transient. implicit and latent. And of course, constantly overlapping, intersecting, and exchanging. it may even be the case that we don’t really “have” social boundaries (or bounded groups and “circles” of people). This may instead be a sociological or social-psychological concept — good for observation and description, not lacking real explanatory power. 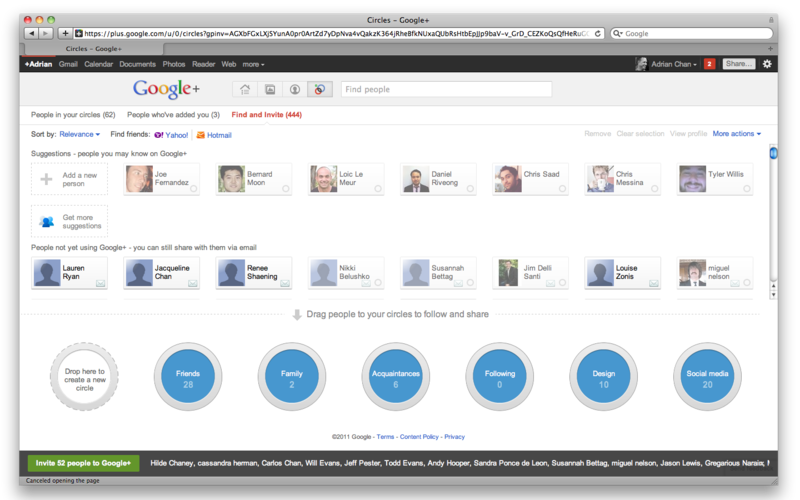 By the sound of it, Google+ asks users to assign people to circles, thus making choices about who belongs. And by order of technical requirements, rendering these choices as explicit, and I believe visible. We learned from Path that this is something users have difficulty with. True, the concept of Path makes sense and rightly addresses the social scale problem (the “everyone” I don’t have to consume/share content with). But I, for one, had a hard time choosing who to count in or out of my Path friends. I venture that the explicit selection of in and out circles is socially awkward, as well as psychologically and cognitively difficult. Path may have opted for one circle of fifty, and that was perhaps too narrow. 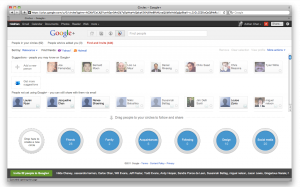 But by the sound of it, Google+ permits many circles. I like the flexibility, clearly a use of groups designed to accommodate the world of realtime streaming and sharing. But there’s a problem introduced by multiple circles: overlap. Again, a cognitive hurdle. Not only do I have to choose people, but I have to group them. In other words (if I get this right), I have to make two difficult choices: who, and by what category. It’s one thing to do this with online objects and content, but it’s another to do it with people. So I’d like to know how Google handled Circle visibility. If circles are visible to others, there will be social etiquette issues to deal with. Something Facebook has done better than Google at every turn. Transience, too, makes Circling difficult to handle well. Realtime social tools permit and excel at transient interaction: passing comments, invitations, greetings, citations, and everything else we broadly practice as “sharing.” So what is the benefit of isolating circles of people for ease of consumption, if the culture of social tools is built on inter-minging? I’m curious. All social tools must seek the greatest amount of social grace in their technical handling of social distinctions. Again, for the reason that when the socially implicit becomes technically explicit, recourse to social negotiation becomes more complicated, awkward, and ambiguous. People lose access to social codes, behaviors, routines, habits and all the other aspects of interaction negotiation. Or as Erving Goffman put it, rituals provide ways of addressing failure in communication when grammar breaks down. We use other social frames to correct the misunderstandings that result from the failed production of communication. Social tools subscribe to the ideology that social opportunities and problems can be addressed technically. Technical re-mediation of social interactions, however, introduce ambiguities of their own. When mishandled, say, by over-zealous hard-coding the soft of social into the hard of technical, these ambiguities place new demands on users to negotiate. And I don’t mean just negotiate the technical use. But negotiate the socio-technical interaction and communication with others that these tools provide for. So I’m interested. And would love to hear from those who’ve got the feel of it. After all, that’s what we’re all dying to know: did Google get the feel of it right? Update: I’ve begun using Google+. Not yet had a chance to see how Circles work in constraining streamed conversations. But here’s a look at the Circles UI.